How Much Does Rhinoplasty Cost in Princeton? As one of the most defining characteristics of the face, the shape and symmetry of the nose can make a dramatic impact on your features. As a result, it should come as no surprise that rhinoplasty, also called nasal surgery or “nose job,” is one of the most popular cosmetic procedures in the nation. If you’re considering altering the shape of your nose to enhance your appearance or improve nasal function, knowing in advance how much this operation can cost can prove invaluable to your decision. 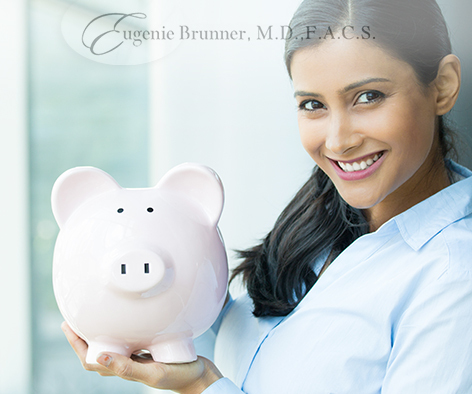 Dr. Eugenie Brunner, our experienced facial plastic surgeon, will detail the fees associated with your customized nasal surgery during your initial consultation, and the following are some examples of what can be involved in determining the full price of treatment. The first matter to realize is that the full cost of rhinoplasty is comprised of several individual fees. When requesting quotes from facial plastic surgeons, be sure to ask what is included in the number. In addition to the surgeon’s fee, which may be the only one offered if the quote sounds low, there may also be the surgical facility fee, hospital garments, medical tests, anesthesia fees, and several other elements that affect the total price. Additionally, the cost may fluctuate depending on the surgeon’s years of experience as well as the geographic area of the practice. We realize that undergoing rhinoplasty is a big decision, and at our practice we offer a number of financing options to help bring this procedure into your budget. If you prefer to pay upfront, we accept cash, check, debit, VISA®, and MasterCard®. If you prefer to pay over time, we offer healthcare financing through CareCredit®, a reputable lending agency with a variety of affordable payment plans for qualified applicants. If you have any additional questions about rhinoplasty or the typical costs associated with this procedure, or if you would like to schedule a consultation with Dr. Brunner, please contact us today.